Now you can take on the toughest off-road racecourse in the world and challenge world champion Ivan Stewart thanks to SUPER OFF ROAD: The Baja. 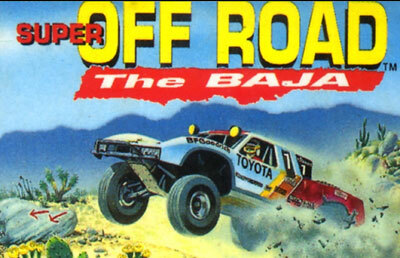 The Baja is the pinnacle of dirt racing, and there are eight different legs patterned after the real course that will throw all kinds of jumps and obstacles in your way as you race for the checkered flag. You can take part in the Mexico 250, the Ensenada 500, and the Baja 1000 as you try to prove your mastery of off-road racing. Throughout each race, you'll have to make pit stops to replenish your fuel supply and make minor repairs and tweaks that could mean the difference between glorious victory and bitter defeat. So prepare yourself for the battle for dirt-track supremacy with SUPER OFF ROAD: The Baja.